Check out this short video to see the newest updates in action! Read on for more details about the updates below. NOTE: There is NO sound on the videos below, so please ignore the "Click for Sound" option. 1. Theme Options for Low-Vision Contrast Sensitivity - Contrast sensitivity refers to a person’s ability to distinguish the difference between an object and its background. For some people with visual impairments following a stroke, it's sometimes harder to identify objects when they are placed on certain colors. To help with this issue, Lingraphica created the option for users to choose from a variety of background colors to suit their visual preferences. 2. 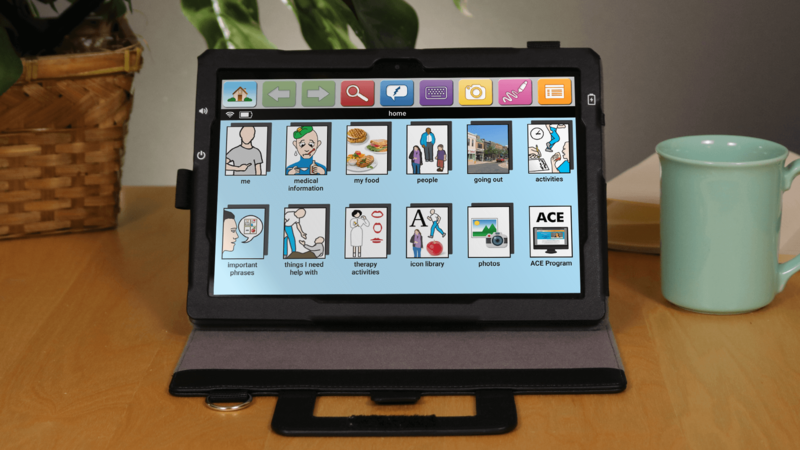 Alignment Options for Visual Field Cuts - Visual field cuts are a visual impairment that sometimes occur following a stroke. The left side of the brain is responsible for seeing the right side of vision out of both eyes, while the right side of the brain is responsible for seeing the left side of vision out of both eyes. Field cuts involve some loss of vision on the side of the body affected by the stroke, and commonly impact peripheral vision. 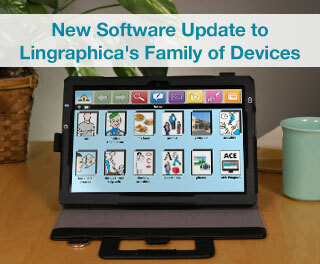 To help users with visual field cuts, Lingraphica updated our software to allow users to choose the side of the screen on which the icons will be positioned for better visibility when using the device. 3. Photo Editor - Our developers at Lingraphica have updated the photo editor in our devices to allow users to do more than just take photos! Now, a user can select a photo that he/she has taken with a device and easily crop it to eliminate unwanted parts of the photo. 4. Home Page Layout - Our home page layout has changed based on user feedback so that it is more functional to device owners. We've reorganized some of the icons and consolidated a few to streamline the look of the home page. Our developers work diligently to update our software based on feedback from clinicians and users to make our devices user-friendly, practical, and helpful in every way possible. Are you ready to start a device trial? Click the button below to get started on the journey to communicate again!